The Duddon River Association (DRA) represents the interests of the furthest west of the five arms which comprise SCRT. The principle river is the Duddon. However, there are three other lesser known rivers which also have a healthy population of eels and wild brown trout, together with a run of sea-trout and salmon. These are the Lickle, Kirkby Pool and Black Beck, all of which discharge into the Duddon Estuary. 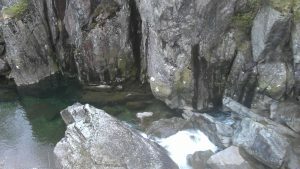 The River Duddon begins its 13 mile journey to Duddon Bridge at an altitude of some 400 metres on Wrynose pass, running due west. At Cockley Beck it turns south, to flow through what still remains as a true farming community. Since it has no lake, it does not attract the same tourists as do other Lakeland valleys. A hugely important factor for all wildlife. The River Lickle joins the Duddon a half mile below Duddon Bridge. Three miles up this valley heading north east lies the hamlet of Broughton Mills, above which the river divides into two. The Lickle itself flows from a westerly direction off the flanks of the delightful 529 metre peak known as Caw. While the splendidly named Appletreeworth beck, runs from the opposite direction having begun its life on Torver High Common. On the opposite side of the A593 lies the source of Kirkby Pool, which begins its 9 mile journey to the estuary and the village of Kirkby in Furness as Steers Pool. Numerous other becks flow into it from the side of Woodland fell, to join above the hamlet of Woodland itself. Below this point the river becomes sluggish and is sadly disfigured by a seriously mistaken approach to land drainage. This can be easily seen from where it runs under the A595 at Wreaks End. Breaking the mould is Black Beck, which is situated on the opposite side of the Duddon Estuary. A sparkling little water, which has its origins at Thwaites Fell on the flank of the mighty 600 metre Black Combe, which towers above the estuary. Flowing past the prehistoric Swinside stone circle it reaches the A595 at Broadgate and then onto Hallthwaites and Green Road, where it meets the tide after a six mile journey through a mixture of fell and farm land. The fishing interests on these waters are exclusively in the hands of Penny Parrock Angling Company Ltd, Millom Anglers and Ulpha Anglers. There are also a number of private land owners with fishing interests. All of these are represented by The Duddon River Association, whose stated objective is “to improve the natural habitat of the River Duddon and it’s tributaries for the benefit of all wildlife”. This presents a considerable challenge, since problems are created from a number of sources in common with the other four catchments within SCRT. 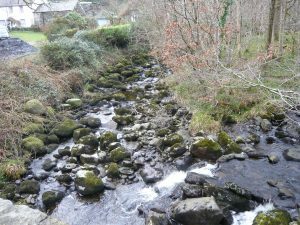 In addition, the River Duddon suffered horrendous damage due to the effects of acid rain in the seventies and eighties which decimated river life and will continue to have a major impact for many years to come. This is especially so on the River Duddon above Cockley Beck. To monitor this situation and the general health of the river, 10 designated sites have been agreed with The Environment Agency, where samples are taken of the invertebrate life by The DRA. All the 22 major becks running into the river have also been sampled, together with the other three rivers mentioned. This programme runs continually. Beck surveys and habitat improvement are other ongoing projects to run in parallel and are proving to be of benefit. Some of today’s threats are presented by pollution of various sorts, abstraction, floods and drought. The flood in November 2009 produced the highest river level ever recorded. The drought which occurred in 2010 is believed to have been the most serious in living memory. 25% of all the becks dried up and a further 50% were down to the bare bones. Climate change is yet another enormous threat. The Duddon River Association and its partners are attempting to deal with the situation as best they are able. One major success story has been the control of invasive species. Himalayan balsam is the most immediate menace and requires an annual gathering of Duddon River Association members to remove it. A further modern day problem to arise in the catchment is the scramble to install Hydro Electric schemes, though at present this is confined to just one location on Logan Beck. A far more ominous threat is presented by the Duddon Estuary Tidal Power Project, which is currently at the feasibility study stage. This activity is being anxiously monitored by The DRA. On a more encouraging note, tree planting led by the National Trust was undertaken at the head of the Duddon valley where few trees currently grow, this will prove to be of major benefit to all wildlife and help to prevent both bank erosion and flooding in the longer term. 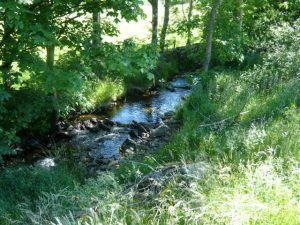 Going forward, a programme of electro fishing to ascertain which of the tributaries are used for spawning is at the top of The Duddon River Assocation’s wish list, and establishing a Wild Fish Protection Zone is being contemplated. To view the catchment plan for the Duddon Valley please visit our Becks to Bay partnership website.